If you look in your kitchen cupboards it is very likely that you will find a bottle of honey. In the past, before sugar was widely and easily available, honey was the primary sweetener used in cooking and baking. Many of us have lost touch with this wondrous ingredient and its many uses. If you have that bottle of honey around to sweeten your tea or for that one recipe from your Grandma that uses it, you are missing out on all the other ways that honey can enhance your life. The only way that honey can be made is by bees. In the wild, bees collect nectar from plants and flowers and bring it back to their hive. Through a process of ingestion, partial digestion, and regurgitation, the bees transform the compounds found in the nectar into liquid honey. The honey is stored in the hive as an alternative food source during the colder winter months. Over time, much of the water in the honey mixture evaporates allowing the honey to “ripen”. This evaporation process is aided by the airflow created by the movement of the bee’s wings. It is this evaporation process that helps prevent honey from fermenting and allowing for a long shelf life without the addition of any preservatives. When most people think of honey, they think of adding it to tea or maybe spreading it on bread. 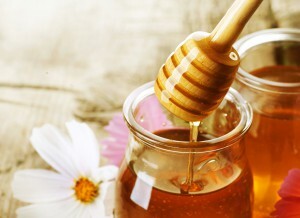 But honey can also be used to soothe sore throats, curb coughing, and to care for hair and skin. Honey has been used as a sweetener and source of carbohydrate-based energy since ancient times. It can be added to almost any recipe to enhance the flavor, improve moisture retention, or as an alternative to sugar. Honey can be used for its unique flavor or to enhance the flavor profiles of other ingredients. When used as a sweetener, it packs such a punch that you can use less honey to get the same amount of sweetness. It is a favorite addition to sauces, salad dressings, and marinades because it also acts as a thickener and an emulsifier, helping to bind other ingredients together. In baked goods, honey adds as a humectant which helps to retain moisture. Try out these delicious dishes for a taste of how versatile honey can be in the kitchen. Honey has been revered throughout history for its medicinal uses and even today, with all that modern medicine has to offer, honey remains helpful in treating some symptoms. When it comes to the common cold, which is caused by a virus and has symptoms like a bad cough and a sore throat, honey can be as helpful as many over the counter medicines used to treat these symptoms. Add a healthy dollop of honey to a hot cup of tea, take a spoonful of it straight, or try making a Honey Citrus Soother as soon as the sniffles start. Honey is also a great ingredient in hair and skin care products. The natural humectants in honey help hair and skin retain moisture. Honey can be found in many natural beauty products but you can also add honey to your favorite cleanser or conditioner. If you are feeling adventurous, you can also make your own beauty products using these recipes. You can find local honey right here in Arizona from these producers. This entry was posted in Arizona farmers and ranchers, Food Facts, Uncategorized and tagged arizona honey, Bee, Business, Fill Your Plate, food, honey, honey farmers, Salad, Shopping, Sweeteners, Tea. Bookmark the permalink.